Although I feel like I was run over by a truck and my left calf isn’t doing what my brain asks it to, it was worth winning the Garbanzo DH yesterday. I don’t think anyone really understands how painful that race is until you do actually go through it. The conditions were pretty nasty too, making it a bit more gnarly than usual and physically harder as well. I’m not gonna say, “but it was fun” cuz it wasn’t. Instead, I’ll say it was rewarding to win! Props to Manon who wasn’t far behind…she rips it! And to CDHG, Miranda, rounding out the podium with 3rd. Check out the Pink Bike Vid. Chris was on a very fast time and we were all so stoked and then the timing and screen went blank…….nobody really knows what happened but he came across with a different time. There were some other time discrepencies but I think they were confused by all the passing and things that went on. Some people say he got robbed but either way, he did awesome, official results say he was 4th! Nice work. Today was the Air DH. I Finished 5th, definitely feeling tired from yesterday but I never really do super awesome at this race anyways….Chris ran out of gears with his monster legs and finished in 10th. Good effort. Need to get some bigger rings. Strange race though, the Air DH, some super amazing World Cup riders end up off the back and some shine! Congrats to CDHG, Sarah, with a 3rd place and on the podium. Early in the morn, I’m off to Panorama BC for the Canadian Championships. 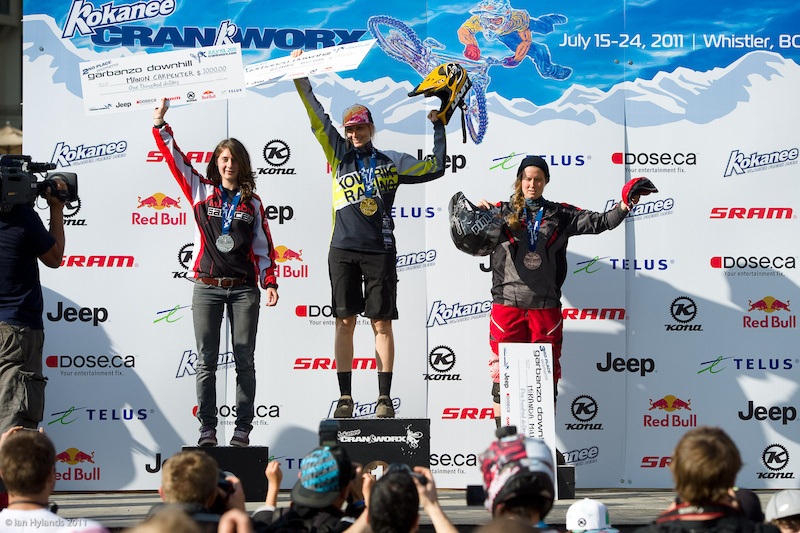 Hoping to come back with the medal cuz my old one went missing when Schinken(our old- I guess you can call him-mascot) was kidnapped in Mont Saint Anne…..
← Canadian Open at Crankworx.